Striving to attain maximum customer satisfaction, our renowned engineers art Shri Vinayak Packaging Machine Pvt. Ltd have come up with another world class product. 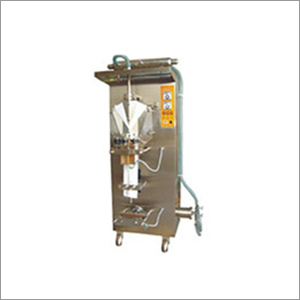 Manufactured under the guidance of our experts, the Liquid Pouch /Sachet Packing Machine is a product made with high precision. Due to it's fabrication with high quality materials this product has been given the green signal at various stages for reliability and durability. Constructed with stainless steel, these machines are robust in design and can efficiently pack up to 1000 grams. Used to pack commodities such as free flow liquids, package drinking water and milk, this machine can be customized as per our clients specifications, at very economical prices. With safety being our top priority, we ensure that this equipment goes through vigorous safety checks to give a flawless product to our customers. Copyright © 2019-20 by SHRI VINAYAK PACKAGING MACHINE PVT. LTD. All Rights Reserved.